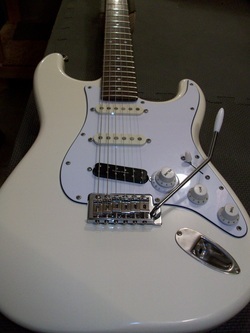 Work Order- Mid 80's MIJ Strat-Install new tremolo, fix wiring issue causing noise in certain pickup configuration. I have been given free reign to work on this guitar as I see fit (it's nice to be trusted). 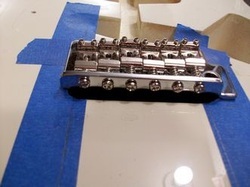 The main issue is the busted up tremolo that no longer works as it should and since these are no longer made I had to figure out what to put in there. I must admit I love the funkiness of this tremolo but it no longer works as it should and it's killing the sustain of this beautiful guitar. The studs on the tremolo are not at standard distances, not even close actually, they are much wider apart than a modern trem. If I were to install another trem that used studs I would have to plug these holes with some hardwood plugs and touch up the paint in those areas and drill two new holes. I decided to go with a high quality vintage model with the six small screws that hold it on (you really only need the two outside ones) and a new pickguard that matches the original one. The new pickguard will actually cover the original stud holes so I can leave them alone which will allow this guitar to go back to stock condition if needed. The new tremolo is higher quality than stock ones that came on these guitars and should give this guitar a great sound and with its solid steel block instead of cast it should have some serious sustain. 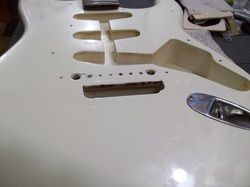 The wiring issues will be addressed when I switch everything to the new pickguard. I feel it is probably an issue that occurred when the onboard tuner and or the "Little '59" humbucker was installed. After mapping out the center of the trem opening and checking to make sure the trem was sitting the correct distance from the nut which is 25.5 inches (some saddles are farther back and some are closer, this is the average distance) I discovered that the trem opening was too close and needed to be shimmed. 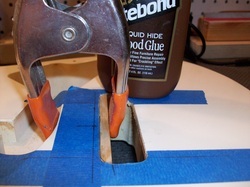 I cut and shaped a piece of wood to fit in the trem opening. I glued it and after it dried I pre-drilled a couple holes through it into the body of the guitar and installed a couple wood screws to reinforce it. Even though it would be hidden by the new trem I went ahead and painted the added wood to match the guitar. I then drilled the six screw holes for the new trem, these need to be almost perfect for the trem to work properly. 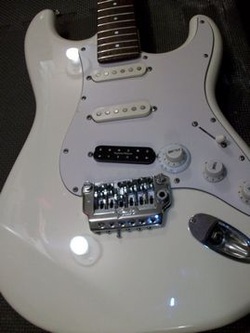 After rewiring all the electronics and adding a new pickguard that fit this tremolo and covered the old stud holes this MIJ Stratocaster is as good (or better) than new. The customer was thrilled with his new old guitar.